The production of iron, steel, and aluminum is a highly energy-intensive process, accounting for 10% of total manufacturing energy use. The use of recycling in the manufacturing process of these metals has been a main driver of improvements in energy efficiency within the industry. Primary production, in which steel is made from iron ore and aluminum from bauxite ore, is energy intensive. However, secondary production, which involves the use of recycling scrap to make steel and aluminum, is much more energy efficient. The Environmental Protection Agency estimates that secondary steel production uses about 74% less energy than the production of steel from iron ore, while the U.S. Department of Energy reports that secondary aluminum production requires 90% less energy than primary production. 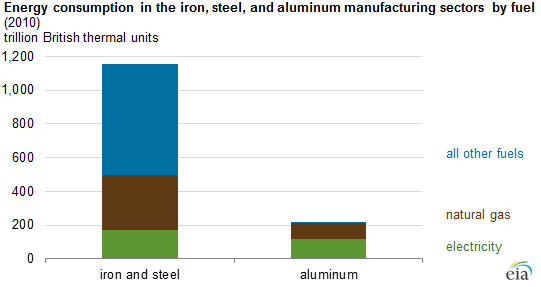 Secondary production accounts for nearly 60% of U.S. aluminum production (counting both old and new scrap), while primary production accounts for almost 40%. Similarly, recycling is used in most steel production. According to the U.S. Geological Survey (USGS), 40% of U.S. steel production in 2011 came from basic oxygen furnaces (BOF), whose inputs are almost 80% pig iron (molten iron), whereas 60% of production came from electric arc furnaces (EAF), which use more than 90% scrap. Primary production of steel usually involves using a blast furnace to produce molten iron from iron ore, coal, and coke, using fluxing agents such as limestone to remove impurities. The molten iron (pig iron) is then converted into steel by a BOF. Secondary production facilities typically use an EAF, with scrap providing the main input. In an EAF, scrap is melted using electric arcs, which can be supplemented with natural gas-fueled combustion. The high energy use of a blast furnace is eliminated by secondary production, with the exception of small quantities of pig iron used as an input along with scrap. Another alternative to using a blast furnace to produce pig iron is using direct reduced iron (DRI), a process typically fueled by natural gas. Scrap continues to be the primary raw material used in EAFs, but DRI may become a larger component in the raw materials mix. Iron and steel scrap is classified as home, old, and new scrap. Home, or mill, scrap is generated in the steel mill during production and is recycled in the same facility. Old scrap is postconsumer scrap. The largest source of old scrap is discarded automobiles, along with appliances, machinery, worn out railroad cars and tracks, demolished steel structures, and other steel products. New scrap is produced during the manufacturing process. In addition to domestic use in steel production, iron and steel scrap trade is significant. In 2011, USGS reported that the United States exported 24.3 million metric tons of scrap, while importing 4 million metric tons. The primary production process includes mining bauxite, refining it into alumina, and smelting the alumina to create aluminum. Secondary production involves treating scrap aluminum, melting, and then refining. Aluminum can be recycled indefinitely, contributing to the efficiency gains caused by increased recycling. Recycled aluminum requires only 10% of the capital equipment costs compared with those for the production of primary aluminum. Aluminum that will be recycled is classified as new scrap and old scrap. New scrap is generated when aluminum products are manufactured. New scrap includes defective products and scrap from every step in the production of aluminum products. This can be a large percentage of the total aluminum produced. For example, some manufacturing from aluminum sheets may recover as little as 35% of the original ingot weight as shipped product. New scrap also includes aluminum-bearing residual material skimmed off molten aluminum during smelting operations, but excludes home scrap, which is scrap generated and recycled in the same plant. Old scrap comes from discarded, used, worn-out, and out-of-date products. Primary components of old scrap are automotive parts, appliances, beverage cans, wires, cables, and building materials. The Aluminum Association estimates that in 2011, 65% of aluminum cans were collected for recycling. According to the USGS 2012 and 2011 Aluminum Minerals Yearbook, 45% of old scrap in 2012 and in 2011 came from used beverage cans. There can be a large lag time from when an aluminum-based product leaves the shipping dock and when that aluminum scrap becomes available for recycling. For beverage cans the lag time may be only about 65 days, where aluminum used in construction may have a lag time of 40 to 50 years and aluminum used in automobiles has a lag time of 12 to 15 years.